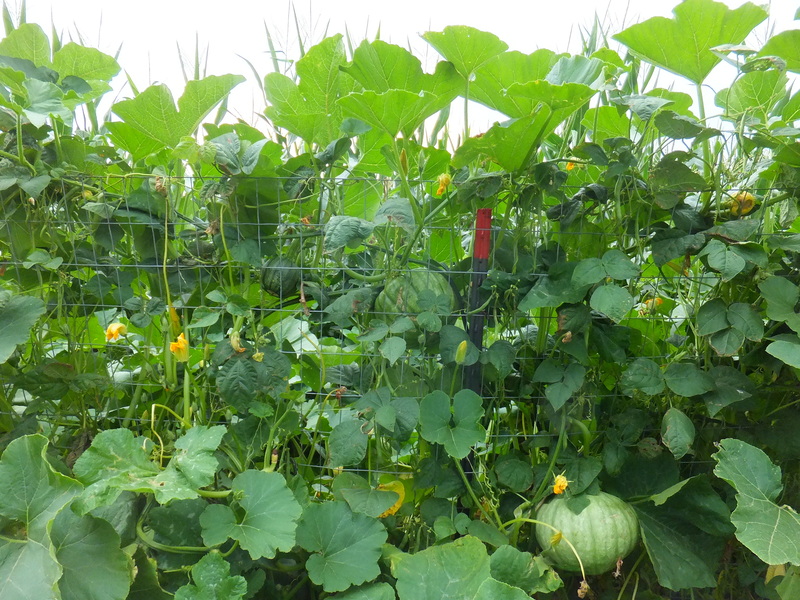 The jungle above is what happens when you plant pumpkins too close to pole beans. I planted Kentucky Blue Pole Beans, my first try with pole beans as I never thought I wanted to mess with a fence. But it turns out they weren’t much work, and grow well here. I planted them in a row and after they were up and growing, I weeded and mulched with loose hay chaff from the barn. Then I put a five-foot high fence right beside them. They took to the fence rapidly and would have grown higher if my fence had been taller. They were doing very well until the pumpkins, which were planted three and six feet away, made there way over to the fence and started climbing. All the shade from the pumpkins may have hurt yield, but it doesn’t matter now as the sweet corn is ready. We ate green beans every day, but now I realize they were just a place-holder on my plate until the sweet corn was ready.